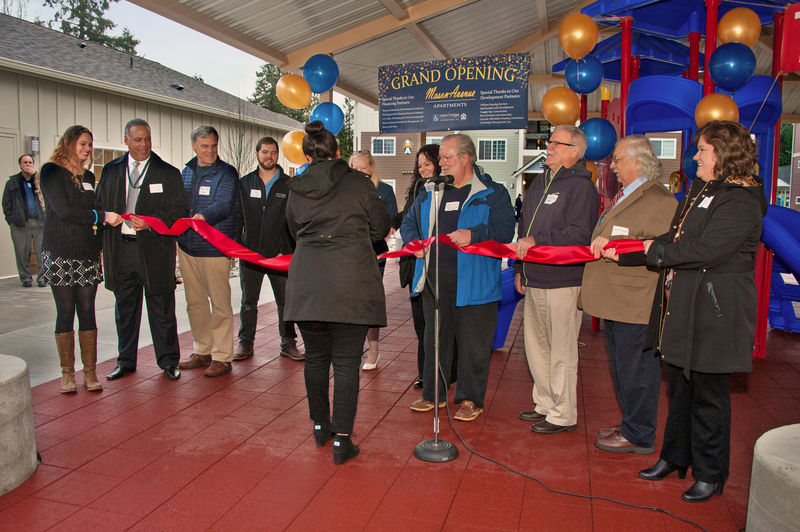 Mason Avenue Apartments in Tacoma, WA celebrated its grand opening January 13th. The mayor of Tacoma, Marilyn Strickland, and City Council Member Keith Blocker spoke to residents and guests about the much-needed affordable housing Mason Avenue brings to the Tacoma community. Pictured above, from left to right: Carolina, Mason Avenue resident; Pam, community manager; Jace, maintenance technician; Paul Page, Vaughn Bay Construction; Carey Jenkins, City of Tacoma; Julie Ryan, CMI regional manager; Kanani, assistant manager; Bruce Kilen, Trillium Housing Services; Steve Page, MacDonald Ladd Development; Dave Westfall, Trillium Housing Services; Cathy Morton, City of Tacoma; Tess Colby, City of Tacoma. Several resident ambassadors opened their homes for guided tours. Afterward, residents and guests enjoyed refreshments and cake. We are so excited to officially welcome Mason Avenue Apartments to the Cambridge family of communities! Resident Ambassador, Carolina cuts the grand opening ribbon. Learn more about Mason Avenue Apartments it www.MasonAvenueApartments.com. Such a success for this project. It had welcomed a lot of families in the community. Mason Avenue Apartments will definitely be a home for many happy families.